Well, Hello Lovely!! Yes, this is the name of a paper, but isn't it great that I have the opportunity to call you lovely? I was looking at this beautiful paper this morning and the retired card boxes I have on my shelf. I thought I should put something together so that you can share in the joy of this paper! Hello Lovely complements - no stamping required with this kit! 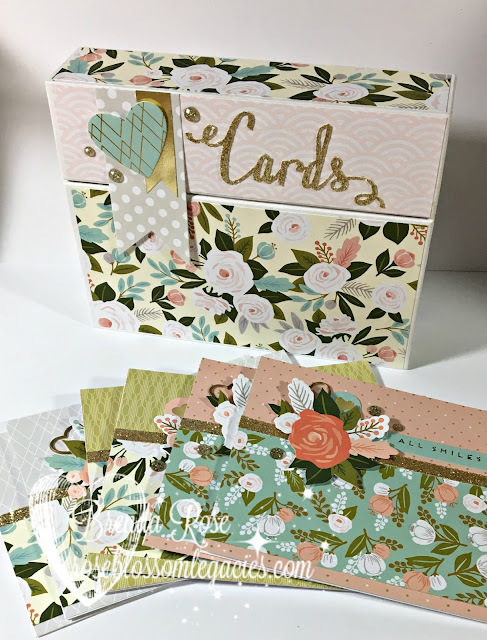 Gold Glitter Paper Strips and "cards"
I struggle with floral patterned papers... especially combining a few different floral patterns. You are the master! What a gorgeous kit!! !